Home Board Games Klask On! 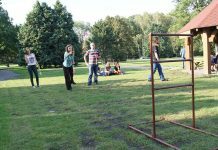 If you live outside of Europe, Klask is the game you have probably never heard of. Nor had I until one of my favorite pubs bought a board. Here is how to play Klask, plus rules, tips and a description of game-play. 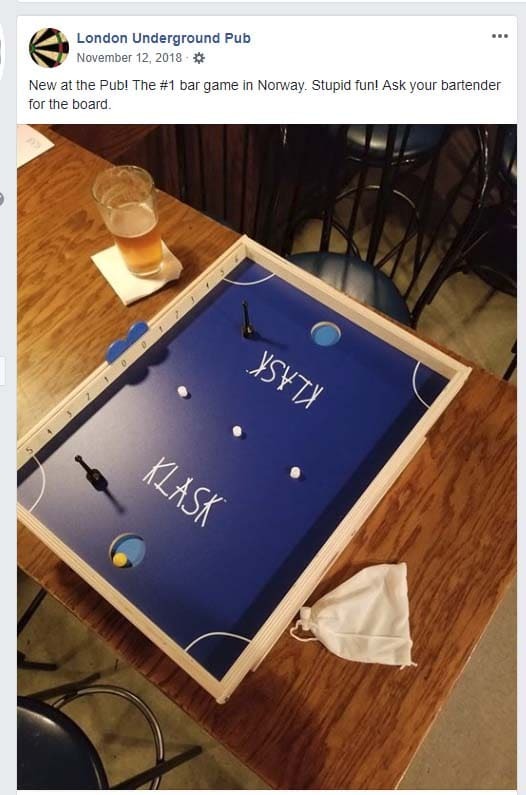 Klask is way-fun, and I can definitely understand its growing popularity in the United States both at home and in the bar. Viking Culture and Game-Play, Then and Now. When not navigating the high-seas with oar and wind-power to explore, maraud, and pillage, the Vikings back home had to deal with impenetrable damp and cold winter nights that lasted up to 16 hours. They are still known for the songs and stories and games they played by the warm hearth, drinking ale in the hall during the Viking Age of the 9th through 11th centuries. 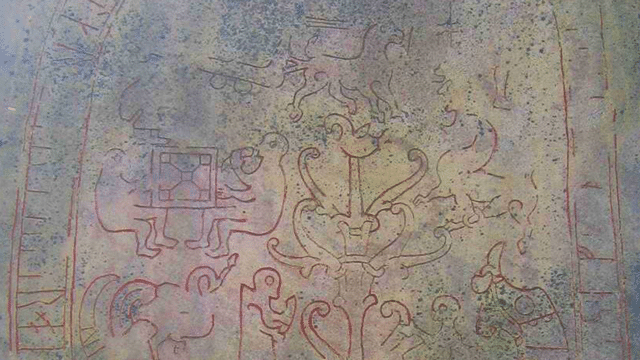 Viking Runestone from the 10th Century depicting merriment and games being played. 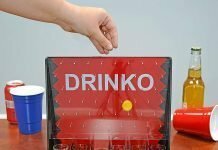 A new bar game also emerged out of Denmark in 2014, and similar to Viking culture, it is easy to see why Klask has quickly spread through Europe, and recently to bars and homes across the Atlantic. Klask is fast-action-ricochet-magnetic two-player fun with angling and banking, strategy and finesse. The game is similar to air hockey and played on a wooden board referred to as “The Pool”. Conceptualized by former carpenter Mikkel Bertelsen, the Klask board is well-built, sturdy, and flat. The pool is 14” by 18”, and lifted up 5 ½” by leg-frames. Each player’s instrument of attack and defense is called a “striker”, a 1 1/2″ tall magnetic piece that resembles a chess pawn. The striker is maneuvered by a steering magnet, a similar-sized cylinder-shaped piece, held under the board. Underneath the table, a partition divides the table in-half so you cannot move your striker into your opponent’s territory without losing control of it. The magnets are strong-enough to hold the striker firm to the board, which makes it easy to fluidly to move it where you want it. 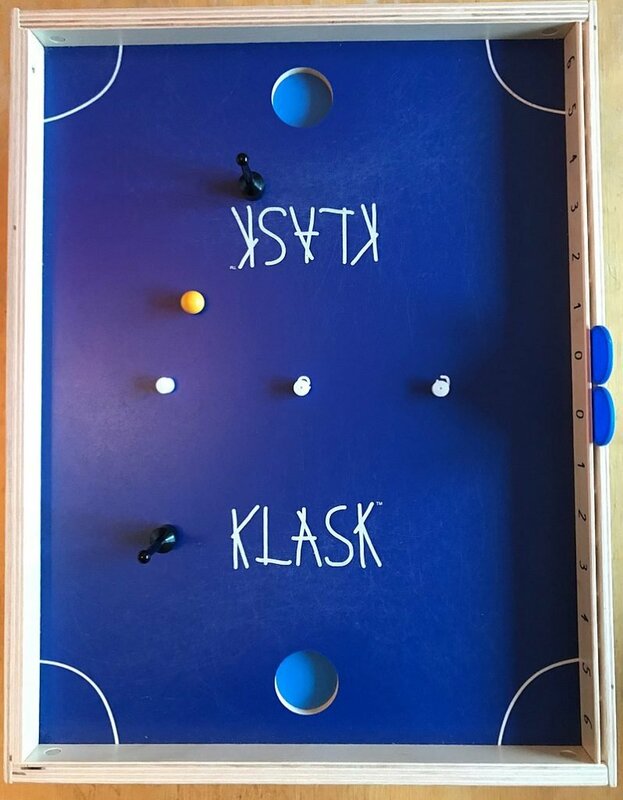 Instead of a puck as in air-hockey, Klask uses a single ball that is not magnetic. 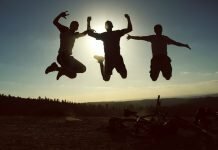 There are four ways to score points in Klask. The primary way is to make the ball into your opponent’s goal, which is a ~one inch cubbyhole in the center of each end of the pool. If your striker falls into your own goal, it is a “Klask” and the opponent receives a point. This affects defensive strategy, because it can be easy to fall in your own goal while trying to defend it. At the outset of each round, three smaller circular magnets known as “biscuits” are placed in their marked position in the middle of the board. The biscuits are magnetically attracted to strikers, and if two or more become attached to your striker, your opponent scores a point and it ends the round. This extra obstacle really adds to game-play strategy, as the biscuits will get ricocheted all over the board during long rallies. If you lose control of your striker in enemy territory and are unable to attract it back to your side, your opponent also receives a point. On one side of the board checks are moved to keep score. A game is played to six, and you can only score one point per round. I first heard of Klask on a facebook post in October 2018 from my old favorite pub the London Underground in Blacksburg, Virginia. They had just acquired a board, and were encouraging patrons to come try it out. 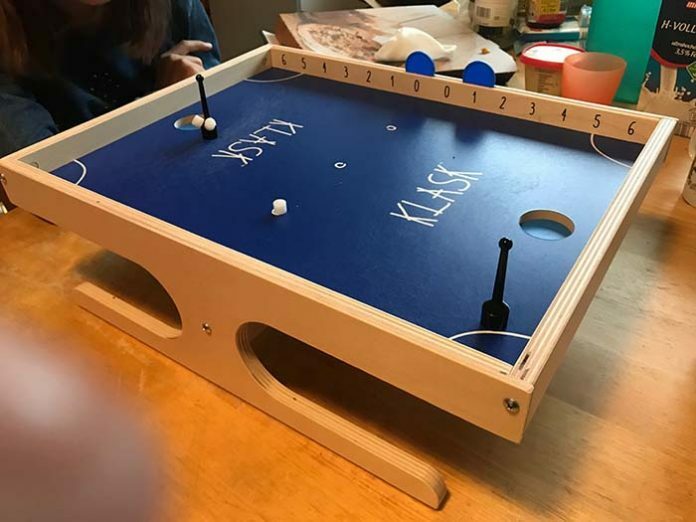 I had enjoyed air-hockey as a kid, and Klask looked more manageable for home play, so I had a board shipped to the house. My girlfriend and I have been watching The Last Kingdom on Netflix so I invited her to try out this new game from “Daneland” (as they call it in the show) on the kitchen table. From the get-go the rules made sense and it is easy to pick up. It is the “hands-off” nature of moving the striker under-the-board with the steering magnets that makes this game from the get-go. When you lose magnetic control of the striker it looks funny and can topple over and be batted about by the ball. You can recover it with the steering magnet if its in your territory, which cause the striker to pop-up steadfast ready to battle again. That, and when you’re surprised by one or more biscuits unexpectedly attaching themselves to your striker makes for good laughs throughout the game. It is also exciting when you learn the reach of the magnetic attraction of the biscuits to the striker. I think it is around an inch so they are pulled towards any striker in that vicinity. You get one stuck to your striker and it slows your mobility. That raises the stakes because if anymore biscuits attach themselves to your striker, it ends the round with a point to the opponent. The biscuits get bumped around quite a bit by the ball, which can make each round unique and interesting due to where the biscuits gather. 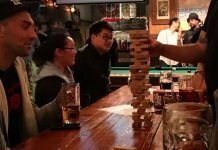 After starting by playing a race to three to try it out, we found it too fun, cracked open beers, and changed it to race-to-five matches and called rematch at least four times. 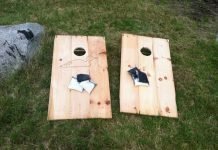 When you think of game designers, you don’t tend to think of carpenters like Klask inventor Mikkel Bertelsen. Always working to innovate, he invented Klask after finding an excess of magnets in his shop and wanting to use them in some sort of game. He gave the first few copies to his friends and with word-of-mouth, 3000 orders came in over the following year, each of which he made in his garage. 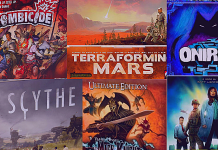 Multiple game companies now distribute the game, and can be found in Target, Amazon, and most places where you buy board-games in the US. Now that you’ve had a look at the game, try it out for yourself at home. And let us know if you find a bar that would be perfect for Klask! After writing a couple of articles about two of my most favorite bar and home games, Pool (How to Play Straight Pool and The Best Pool Movies) and Bocce (Bocce Al Fresca), it was refreshing to try out this new game with a weird name from Denmark.